I am often asked what to bring or what to wear to a photo session. I will always tell my clients to bring their favourite outfit (or three), but I also offer them my studio wardrobe to choose from too. I have a lovely collection of clothing that I can collected over the years in a variety of sizes. I think it’s important to consider the personality of the subject when styling a photo session, as I want to not only capture their image in a timeless style, but I want to show little insights into the type of person they are, what interests they may have, or even play on one of their features. Often if a child has stunning long curls or very long hair, that would be a big feature of their styling. If a child has very fine features then they may suit having their hair swept back gently off their face so that those features are the focus. I try to keep props to a minimum, only using them to add to the story I am trying to tell or sometimes to help my subjects feel more comfortable in front of the camera. Styling is a huge part of creating a timeless fine art portrait. 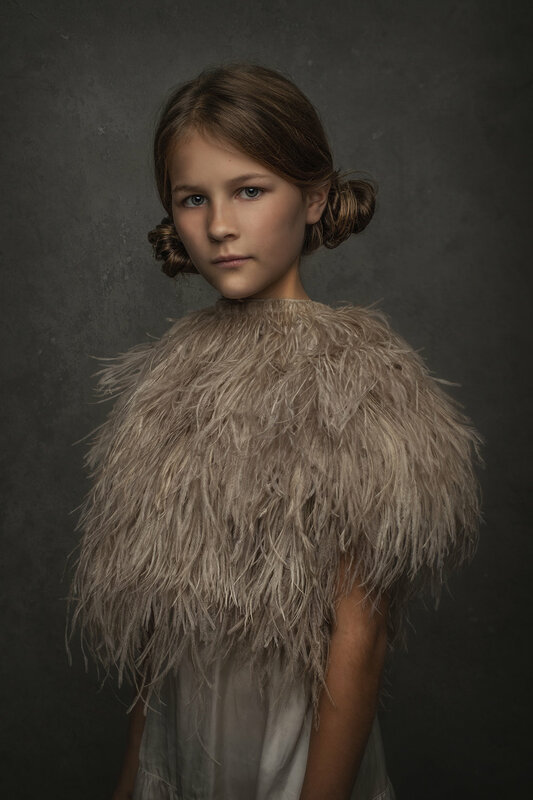 Modern clothing doesn’t always work with this style of children’s portraiture, sometimes it’s best to select something that isn’t on trend and go with something entirely different to what you normally would. I can certainly guide you and together we can come up with something that you will love as much in twenty years, as you will today. This is Jacqueline. She is a real little softie; delicate in her features but also quiet and quite shy. I thought that this beautiful Ted Baker feather shrug would suit her perfectly, complimenting her softness and fine features. I loved the tones in the feathers which I think enhance her olive skin and blonde hair. If you would like to explore some options for your own children’s photo session, click here to contact me today. Copyright 2019. Kelly Stephens Photography. All Rights Reserved.